The ideal transit partner for monitoring materials between destinations. Safely transport reagents, clinical samples, vaccines, pharmaceuticals and food items to any location. Purchase TraceableGO™ Datalogger. Download the App. Start filling in the unknowns in transit. Once a trip is complete, use a TraceableGO™ App to quickly download a PDF report via Bluetooth and e-mail it anywhere immediately. 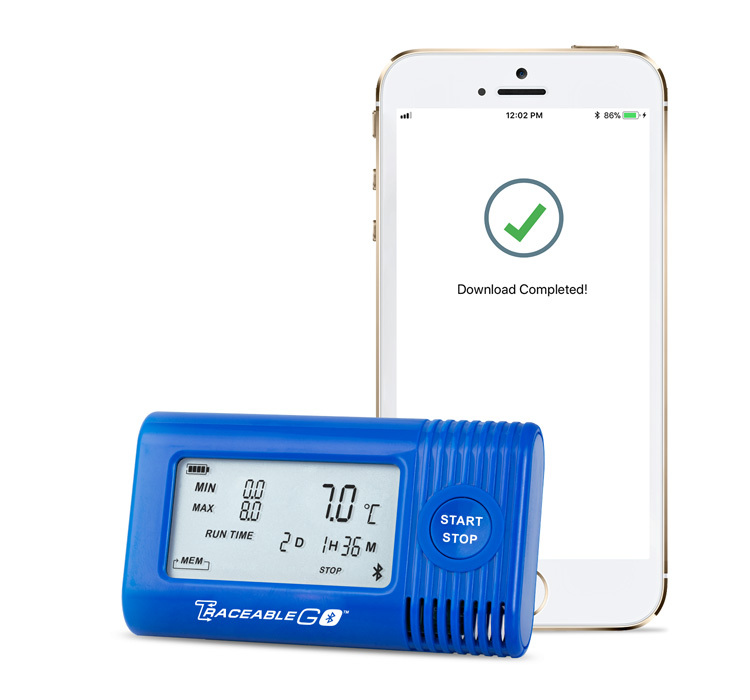 The TraceableGO™ Bluetooth Dataloggers require one of the following apps. Choose the one that fits your needs. 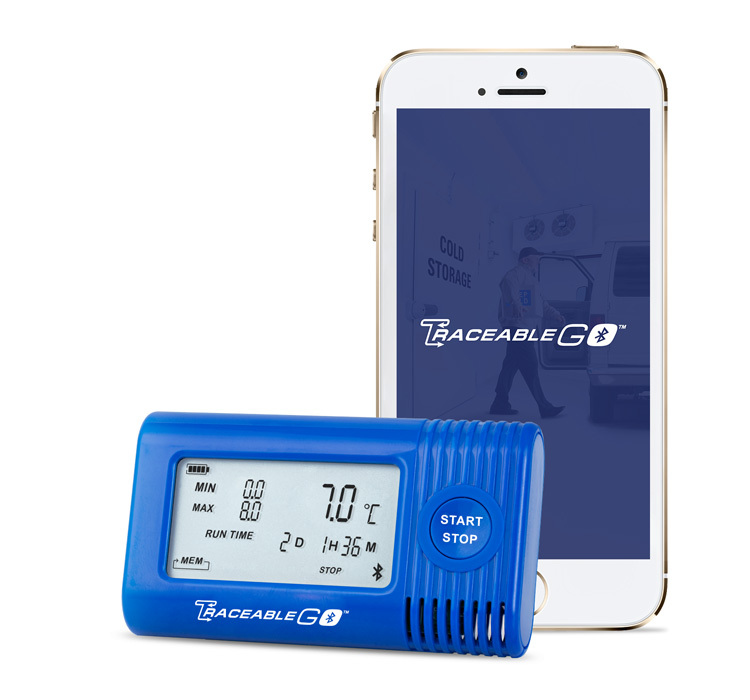 Is one of the Apps listed above required to use the TraceableGO™ Datalogger? Yes. Without the app, you will not be able to start new trips, adjust parameters, download the data, or export the data. How do I enable the Bluetooth Signal? How is the time set on the logger? Can I clear the memory without the mobile app? No. Data can only be deleted with the mobile apps. Can I download data multiple times? What issues could affect battery life? During battery replacement, how to ensure no lost data? Change batteries within time of logging interval. Each device will maintain stored data not yet transitted even after battery removal and replacement. When should I replace the batteries in my TraceableGO™ Dataloggers? We recommend changing batteries when the battery level is at 25% or lower to avoid losing power during a trip. Is there a battery replacement procedure? Simply replace the two exhausted AA alkaline batteries with two fresh AA alkaline batteries. How do I register for a TraceableLIVE® account? Go to www.traceablelive.com and follow the prompts after clicking "New Account"
Where Is Data Stored when I upload it with the TraceableLIVE® App? Customer device data is stored in a SQL Azure database. Report data resides on the Microsoft Azure Platform. How Long Is Data Available? Customer device data is available for the life of the account. The Azure platform has received numerous certifications for compliance with various security and data privacy standards. These certifications can be found at https://azure.microsoft.com/en-us/support/trust-center/. In addition to the security of the Azure platform, TraceableLIVE® implements additional security in that all communications between TraceableLIVE® devices or users and the cloud is encrypted using the HTTPS protocol. TraceableLIVE® uses OWIN authentication. TraceableLIVE® uses a role based authorization scheme that restricts app users’ access to functions based on their role (Admin/User). TraceableLIVE® data queries are partitioned by account id, to ensure that no user will ever see data from another user account. Each TraceableLIVE® device is uniquely identified and validated by the cloud service in order for it to connect. Are emails and other electronic communications encrypted? Emails sent from TraceableLIVE® are not encrypted because most email users do not use email encryption technologies like PGP. What is the Defined Disaster Plan? The cloud services and associated infrastructure for TraceableLIVE® is geo redundant and can be spun up in any Azure data center worldwide in a matter of minutes. Microsoft also guarantees a 99.63% uptime as part of its Service Level Agreement on the weakest link in the TraceableLIVE® infrastructure The SQL Azure database backups are retained for 35 days. Databases restore points can be from 5 min – 35 days back. Web interface to cloud - Is there a recommended browser to be used? Mobile App interface to cloud - What OS' and versions are supported? 6 months at default 15-minute communicating interval. After a low battery alarm is received, what is the expected time to complete depletion? Initial alarm is at 20% under standard conditions and communication, 2+ weeks remaining. Reminder notifications are sent every 3 days. Change batteries within time of logging interval. Each device will maintain stored data not yet transitted even after battery removal and replacement. Recorded data not yet transitted to cloud will not be erased until transmission is confirmed. It really is simple and self-explanatory. Four AAA alkaline batteries are required for device operation.